There’s a quote that is attributed to President Eisenhower that asserts, “What is important is seldom urgent and what is urgent is seldom important.” His quote mirrors this more popular saying: “the urgent is enemy of the important.” Both quotes speak to the fact that too often many of us focus our resources and time on matters of an urgent nature, which invariably leads to ignoring or devaluing the important. To illustrate the concept graphically, I have diagrammed a dot and an arrow. The dot represents the urgent, and the arrow signifies the important. Consider that a dot is short term and finite while an arrow is long-term, and even infinite in some instances, which we’ll explore further below. This dot and arrow issue is a problem that is seen in human nature across time. Yet, as much as we struggle with this, it’s very difficult to elevate the priority of the important. There’s one story in ancient Jewish history that illustrates this point as well as any. You may recall the story of Esau and Jacob, twin brothers who were polar opposites, and frequently seemed to be at odds with each other. One day, after Esau had been out hunting for an extended period of time, he returned home famished. In fact, he was so hungry that he was willing to sell his birthright to Jacob for a bowl of stew. In Jewish tradition, the birthright was reserved for the eldest son and offered significant prestige, the carrying on of the family name, the largest portion of the family inheritance and much more. But Esau, living in the dot of the here and now, devalued his birthright, the arrow, and bartered it to his brother Jacob, for a fleeting meal. While he eventually regretted his decision, there was no reversing the course on which he had set his life. His urgent choice permanently sacrificed the important. As I’ve thought about the tyranny of the dot versus the arrow, I’ve contemplated how often the urgent trumps the important, as reflected in the following examples. How often have you set out to complete a number of tasks in a given day when all of a sudden an “urgent” matter appears, out of left field? As quickly as the urgent new priority presents itself, the important tasks that you had committed to completing take a back seat. All of a sudden the important is displaced by the urgent, the end of the day comes, and few, if any, of the important goals are realized. The tyranny of the dot, the urgent, replaces the arrow of the important. 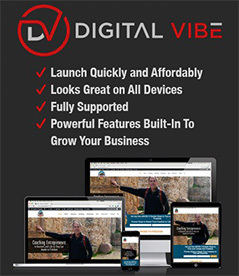 Have you ever been tempted to shortcut quality in favor of quantity in your business or job? This is one of those choices we often face in our business or careers, where the urgent can crowd out the important. The demand to meet a quota, or the need to achieve certain quarterly goals can put us in the predicament of choosing the dot versus the arrow. Will we sacrifice the long-term results to realize some short term gains? If so, we will succumb to the tyranny of the dot. If ever there was a profession that was known for its short-sightedness, it is politics and politicians. It seems that short term wins are all that a politician cares about, at least the vast majority of them. How will the next vote benefit me? Can this constituent contribute to my campaign? What position can I take on an issue that will most benefit me? But in asking all of these questions, the professional politician reveals he has very few laudable values or principles that guide him. His dot is the urgency of self-promotion, always seeking the most advantageous path to further his position. Sadly though, whenever this occurs, the arrow, which could be campaign promises or resolute principles, can so quickly be sacrificed. While all the aforementioned examples are significant, they do not begin to rival the importance and priority of eternity. Perhaps the graphic of the dot and arrow best illustrates this when we compare the dot of our “three score and ten” years on earth with the unending arrow of eternity. Too often, for most of us, we are so easily distracted with the urgency of living in the dot during our short years here on earth, that we tragically short-sell the importance of living for the arrow of eternity, an era when 70 years will seem as a few short seconds and a thousand years will be like a few hours. There is a verse that warns, “What will it profit a man if he gains the whole world and loses his own soul?” Yet the sad reality is that too many will do exactly that. We will live for the here and now, for the dot of our earthly existence but in so doing, we sacrifice the arrow, the opportunity to experience an eternity with our Creator, who wills that all mankind join Him. The Christmas season is a time when many of us take some moments to review the past year, our failures and successes, regrets and achievements. And with the New Year just around the corner, it is also a time when we set new goals, and establish plans to achieve them. 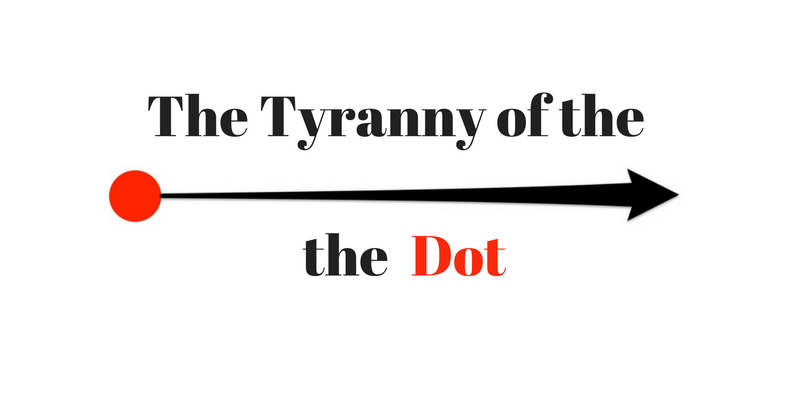 As we spend this time of reflection and goal setting, I pray that we will resist the tyranny of the dot and commit ourselves to living for the arrow. In our daily routines, resist the temptation to fall prey to those urgent demands. In our businesses or careers, I trust we will never lose focus on the long-term and excellence. If you’re a politician, recommit yourself to your guiding principles and resist the temptation to self-promote, truly seeking the good of others. But most importantly, regardless of whether you are a millennial, a baby boomer, or somewhere in between, I trust that you will live your life for the arrow of eternity. If you’re uncertain how to do this, I would encourage you to check out this website: Are You a Good Person? The dot will soon be over for each of us. Will we be prepared for the arrow? I pray we will. Merry Christmas! 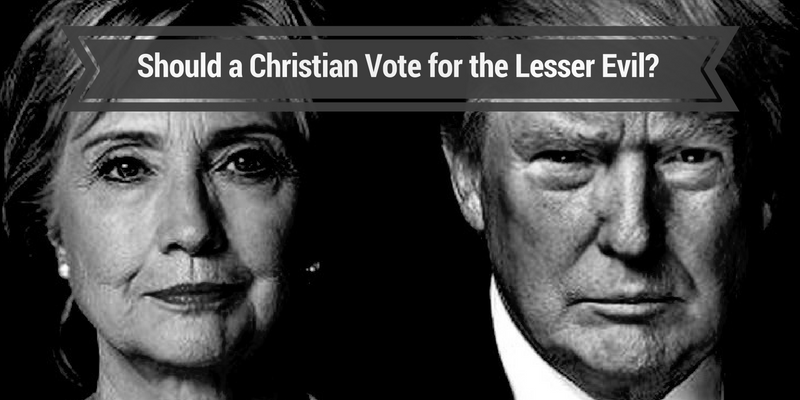 Should a Christian Vote for the Lesser Evil? Over the course of my years of engaging in politics, I have often heard the phrase “the lesser of two evils” used about the choices offered up to voters. But never has that phrase been used more than in the 2016 election. One wonders if all the “lesser evil” choices of prior elections have ultimately culminated in the two worst choices of our lifetimes? Time will certainly tell. As I’ve witnessed the ongoing debate on the Republican side of the discussion over Donald Trump, supposedly the lesser evil, I have seen two arguments arise. The #NeverTrump side asserts that they must follow their conscience, drawn from a biblical/absolute moral standard. The other side argues that in doing so, one would invariably allow a greater evil, in this case Hillary Clinton, to prevail in our nation. This second group asserts that selecting the “lesser evil,” in this case Trump, is a better choice, even a good choice, because it would lessen or slow the advance of evil. Let’s assume, for the sake of argument, that under a Trump administration, evil would in fact advance at a slower pace. If that were true, then is a vote for someone who has a lifetime of the behavior below someone a Christian should vote for, regardless of the evil character of the other option? To be clear, as I enumerated Donald Trump’s behavior, lifestyle and choices, I struggled doing so. The struggle was not because I was unsure as to whether those things are morally reprehensible. Rather, I struggled because I too am a sinner and were my life laid bare, there would no doubt be many choices of which I would be ashamed. So I do not enumerate Trump’s choices and lifestyle to suggest I am better. However, there is a distinct difference between Trump and someone who embraces the Christian message. A true Christian acknowledges his sinful choices and routinely seeks God’s forgiveness for his actions that violate God’s standard. And because his faith rests in the shed blood of Jesus Christ, he has forgiveness from God, because of the death and resurrection of Jesus, the Son of God. So repentance and forgiveness are key to a Christian’s relationship with God. I do not share this to condemn Trump but merely to explain the man. With a philosophy as Donald revealed, it is no wonder that so many of his choices are immoral. But worse, it does not appear that Trump sees any need to correct or improve on his degenerate behavior. To be fair, in the last few months, there have been unsubstantiated reports that perhaps Donald has turned to God. I can only hope and pray that this has in fact occurred. If so, it would be an earth shattering development that could at the very minimum eternally secure the soul of Donald Trump. But back to the original discussion. Is Donald Trump someone a Christian should vote for, simply because he is the “lesser of two evils” in the minds of some? In a world of lesser evils, are God’s principals universal? We can no doubt find countless examples of choices that are both evil, but one is lesser. So what should a Christian do in these instances? In America we are sheltered and removed from the reality of the rest of the world. But for too many Christians around the world, the lesser of two evils is a dramatic reality, and results in their rejecting both options. Take for instance the runoff election in 2012 in Egypt that pitted the Muslim Brotherhood candidate, Mohamed Morsi against Ahmed Shafik, a holdover from the former strong-armed President Hosni Mubarak. If one delves into the backgrounds of both of these men, and what they supported, there can be no doubt that their views, values and track records were at extreme odds with biblical values. So in that instance, should an Egyptian Christian have selected a Muslim, tied to a former dictator, or should the Christian have chosen the second candidate, someone who is a member of the Muslim Brotherhood, a known terrorist group? Neither choice is a good one. Truthfully, they are both evil. God’s standards and principles must be universal and timeless or they are not of God. If one must resort to solely human logic, reasoning or even situational ethics, that should be the first clue that the conclusion one is coming to is likely not of God. Secondly, if the conclusion one is coming to would not work in another place or in another era, then that conclusion must also be suspect. As Americans, and Christians specifically, have continued to chose “the lesser of two evils” over the years, we have seen the quality of the candidates continue to degenerate. This approach has led us to the point where in 2016, the two major options presented to Americans are the two most debased and immoral options perhaps our nation has ever seen. But rest assured, if Americans willingly, and in many cases gleefully, select one of the two options, you can be confident that the choices that will presented in 2020 and beyond will be even worse. Contrary to the theory of evolution, things do not naturally get better. Rather, it’s clear that the world is continuously devolving, absent God’s intervention through spiritual revivals. Consider this truth. If we continue to follow the path of the “lesser of two evils” where might that lead us in the future? There will always be a lesser of two evils, no matter how low on the scale the candidates descend. We could one day be faced with voting for one candidate that believes in abortion while the other believes in euthanasia, or both could believe in such. So it should be clear that at some point the “lesser of two evils” falls apart. So, what should you do if you are a person that has a gnawing feeling that something is not right? Or perhaps you have a quiet voice pricking your conscience to reject both Donald Trump and Hillary Clinton, even though your human logic or friends suggest that Trump would be better because he will do this or do that. If this is you, then I would encourage you to turn to God. As a believer, every consequential decision in your life should have a foundation in and be supported by God’s Word. If not, then question that decision. So if you are a follower of Christ, consider these passages, pray earnestly and seek God’s direction on November 8. Do you feel powerless? Do you feel anger and even hatred perhaps? Is your mind clouded? If you answered yes to any of those questions, then perhaps fear is motivating you. Turn your attention back to God, particularly in this election cycle. Trust Him. Refuse to succumb to your own logic. And God will direct you to the proper choice in just a few days. It may be that God is leading you to reject both candidates and to either not vote, or to select one of the 3rd party or independent candidates. Life is not about winning, in a worldly sense, but about doing what is right from a divine perspective. Personally I find both Trump and Clinton objectionable, one perhaps more than the other, but both a shame for a country that was founded upon biblical principles. So I have been challenged to pray for Trump and Clinton. That I can do. Obviously, my thoughts are not the “final word” on this subject matter. I continue to seek out God and the spiritual perspectives of others. So if you disagree with my thoughts or have some other ideas about this, please email me, or comment on social media. I relish your input. 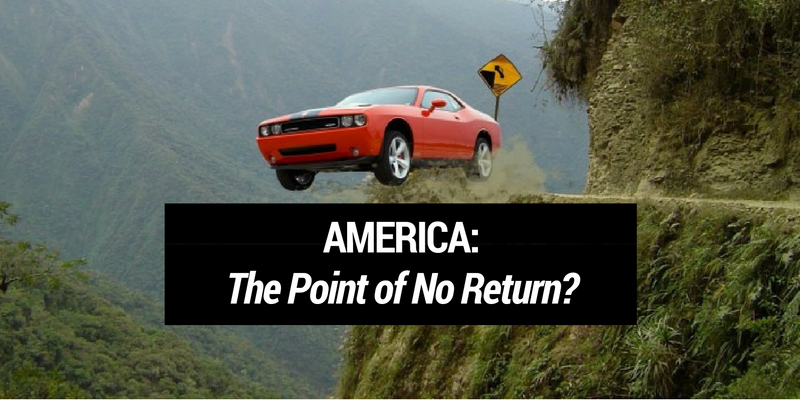 America: The Point of No Return? Over the last decade, I have interacted with hundreds, if not thousands, of fellow Americans, as we have shared our grave concerns over the direction of our nation. There is no doubt that the land of the free and home of the brave is on a course that threatens our future and the very survival of our nation. So we must ask ourselves this question. Have we reached the point of no return? Some may brush off such concerns, believing that America is too big to fail, and asserting that as the world’s superpower, our future remains secure. They reject the voices that continue to warn our leaders, citizens and neighbors that something is seriously wrong, and that never before has a nation ignored and rejected so many warnings and foundational principles, and survived. One only needs to shuffle through history to recognize that nation after nation has ultimately stumbled and fallen when it turned its back on the basic building blocks of any exceptional civilization. Today, I would like to briefly touch on a few of the key foundation stones. If there is one thing that dominates the hearts and minds of Americans it’s the almighty dollar. The economy consistently scores at the top of issues that concern Americans. In fact, the phrase, “it’s the economy stupid” became an often used slogan during the Clinton-Bush presidential campaign in 1992. But with our nation’s current debt at $19,500,000,000,000 (that’s trillion) and its unfunded liabilities exceeding another $100 trillion, many would say that this issue alone has already taken us past the point of no return. 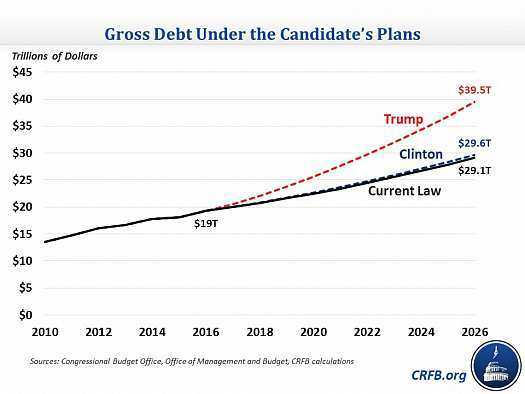 Regardless of who is elected in November, both Clinton and Trump’s plans will continue to increase the national debt, at alarming rates. However, it may surprise you to know that according to a recent study by Committee for a Responsible Federal Budget, our nation’s federal debt would fare far worse under Trump with the debt in 2026 soaring to $39.5 Trillion, double the current debt. Under a Clinton administration, the national debt would rise to $29.6 Trillion. While $10 Trillion less than Trump, both candidates’ plans would put the final nail in the fiscal coffin of our nation. The idea that we can continue to spend into oblivion with no consequences whatsoever is one sign that a nation is on the path to ultimate collapse. There have certainly been periods of political dysfunction and turmoil over our 240 year history as a nation. And I suppose that occurs when men seek and desire power, often above all else. But as we see the magnitude of the problems facing our nation increasing exponentially, the prolonged polarization we are experiencing represents an existential threat to America. Good men and women can disagree, but at the end of the day, opposite sides of an issue must find some common ground if they are to solve problems in a republic, the system chosen by our founders. Of course, this also assumes that both sides are honest players in their desire to solve our problems, which is no longer the case. Without our political leaders seeking the best for our nation, it’s unquestionable that the course we are on is headed for a ruinous conclusion. “Life, liberty and the pursuit of happiness…” — the bedrock values of our nation. In selecting these words, our founding fathers sought to affirm the fundamental rights granted to man by God. By doing so they established the ground rules upon which we would live with each other. These rules, or sacred rights, would be the basis for all future interactions between the hundreds of millions of Americans that would follow them. But in this era, no longer is Life revered and protected. Liberty is being handcuffed and under constant assault. And the Happiness one was once free to pursue is subject to approval, or disapproval, by the state. As all of these founding rights have come under attack, corruption within our government and businesses has skyrocketed. Politicians use government as their own private wrecking ball in destroying those citizens, groups and states with whom they disagree. Businessmen use their enterprises to achieve personal gain, irrespective of the customers they manipulate, prey on, or defraud. Consequently, it’s only fitting that the two candidates for President exemplify the worst this nation has to offer, when it comes to candidates of high ethical standing. We see then that as a nation’s ethics plummet and it removes the foundations of truth, the structure upon which it was built begins to sway and will ultimately topple. Morals, the system by which we determine good and bad, is absolutely crucial in directing the ultimate destination of one’s life, enterprise and even nation. Morals are impacted and greatly influenced by the culture and society. Yet all morals are not equal. Consider that under the teachings of Muhammed, the founder of Islam, it is appropriate to lie to advance the cause of Islam. It is also valid to subjugate non-Muslims, since they are deemed to be inferior people, referred to as kafirs. In contrast, the teachings of Jesus Christ instruct humanity to do unto others as you would have them do unto you, the golden rule. And Christ also taught us to love our neighbor as ourselves. Clearly, these two ideologies, Islam and Christianity, are at two extremes in defining their morals, what is good and bad. Over the last half century or so, our culture has radically redefined our morals. What was good 50 years ago is now bad, and what was bad then is now good. I could spend the next several paragraphs providing examples, but if you’re awake, you know how what was considered evil just a few decades ago, is now embraced, celebrated and promoted. Morals, like ideas, matter. When a nation rejects good and elevates evil, and when that same nation punishes those who embrace good, and it codifies that which is bad, there can be no doubt that such nation is on a short path to collapse. For America, perhaps this is the seminal issue upon which the ones above all rest. A skyscraper is only as sturdy and secure as the foundation upon which it rests. Likewise, the American experiment over these last 240 years has been an extraordinary success because of the Judeo-Christian values upon which it rested. But as those values have not only been attacked, but ultimately replaced over the last few decades with secularism, it’s clear that the experiment has begun to falter. And as it falters, we will have reached the point of no return. We read in Scripture this promise, “Blessed is the nation whose God is the Lord.” But we also read that “A nation without God’s guidance is a nation without order.” Could there be any more fitting description of the condition of our nation today? And if God is the same yesterday, today and forever, as He declares, then we must certainly expect the coming extreme judgment of a Holy God as He has shown in so many other examples over the millenniums. Ronald Reagan, our 40th President, while imperfect, exemplified the values of our founders and sought to redirect the trajectory of our nation. The course we were on was taking us to the point of no return but Reagan’s commitment to revitalize our economy, politics, ethics and morals, while elevating the spiritual, slowed our nation’s arrival at the edge of the cliff. Our rendezvous with destiny is upon us. By our choices and priorities over these last 50 years, we have established that destiny. And while our national destiny is perhaps past the point of no return, individually we can and must establish our own personal destiny, which does not have to mirror that of America’s. I pray you will embark on a plan to secure your destiny, economically, morally and spiritually. 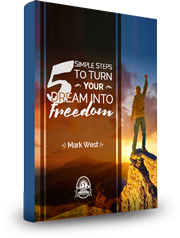 To find out how, check out this previous article I wrote providing some specific and practical steps that we can all take. A good friend and mentor shared the above quote with me this last week and it got me thinking… In this age of Google and Siri, it has become commonplace to find out the answer to nearly any question we have. No longer do we need to go to a bookshelf, pull out a volume of the World Book encyclopedia, to find out the answer to a problem we might be having. Case in point. A couple days ago I was struggling to remember the name of the runner from Jamaica who just won gold for the third time in the Olympics in the 100 meter race. So I picked up my phone, and asked my digital assistant: “Siri, who is the world’s fastest man?” In just moments I had the answer along with more facts than I ever asked for: Usain Bolt, the world’s fastest man. 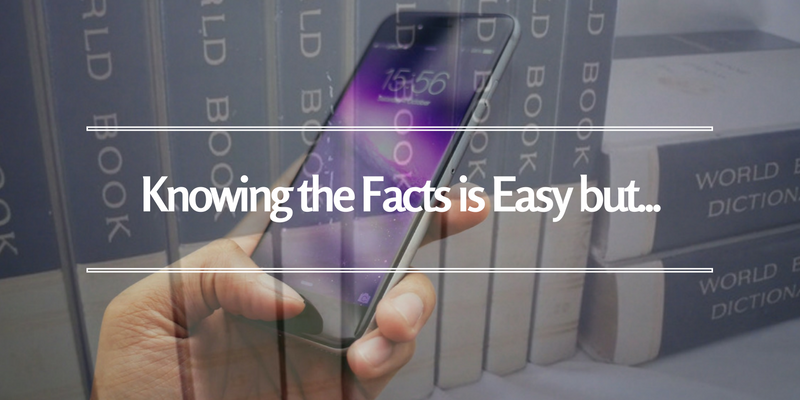 Yet, with our 21st century capacity to know the facts on nearly any subject matter known to man in mere seconds, what has not changed for mankind is the ability to know how to act based on the facts. In fact, it remains just as difficult today as it was for our ancestors thousands of years ago. The truth is, it matters not whether we are talking about our personal life, business, political choices, moral dilemmas, or spiritual quandaries, we often know the facts of a matter, but struggle to make the right choices based on those facts. There are times when we know the facts, but the proper response to the facts is difficult to discern. It may be that the proper choice is not totally clear. Or it could appear that there are pros and cons to all the various options. So discerning which is the best option can be difficult. This can occur when we are too close to the matter, or our experience with the facts at hand is limited. 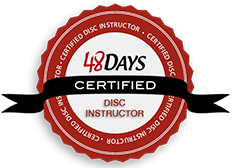 When this happens, a second set of eyes, a new perspective, greater wisdom, or even a personal coach, can bring clarity to the matter, resulting in the proper choice coming into focus. So we should never hesitate to bring mentors, counselors or trusted advisors into the picture, whether in our personal, business or spiritual life. We’ve all heard the phrase, “a mind is a terrible thing to waste.” Well, so is a conscience. Our God-given “inner voice” can serve as a guide in leading us to the proper decision in a matter. While this is true, at times we choose to ignore or question the voice. We know what we ought to do, but we resist doing so. The sad reality of this scenario though is that if we do this often enough, at some point our conscience will grow weaker and weaker, to a point that it no longer serves as a voice of discernment in our lives. And what was designed into us as a guide can over time lose its influence, and even grow silent. Situational ethics can frequently lead us to a justifiable option, but it may be the wrong choice. My set of facts may reveal that I am broke and don’t know how I’m going to put gas in my tank. While I’m in the break room at work I find a $20 bill laying on the counter. No one is around so I justify taking the cash because no one will ever know, “finders keepers, losers weepers” or some other rationalization. I need to put gas in my tank to get home to my family, so I’m ok with doing the wrong thing. So that $20 is now mine. Simple. The end justifies the means. At the end of the day, it’s critical to look beyond the facts and seek to respond to those facts in the correct manner. Whether we seek out a coach or mentor, or we respond to the truth we know to do, or we resist the temptation to justify inappropriate behavior, if we want to succeed and grow in life, we must all too frequently make the tough but difficult choice. Are there other ways you’ve found to do what is right but difficult? If so, send me an email or post a comment below and let me know your thoughts. Imagine a doctor who compromises the proven cure for an illness. 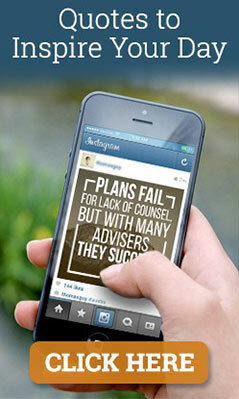 Or a financial advisor who compromises a sure investment. Or a pilot who compromises the correct course heading. Or a Mt. Everest climber who compromises the proper amount of oxygen needed to scale the summit. Or a political party that compromises the very principles and values that built a great nation. Compromise, when resorted to in the wrong scenarios, can have disastrous consequences. Perhaps the only thing worse than being sincerely wrong is being willing to compromise the truth by diluting it with a lie. The art of compromise is one that is an integral part of business, politics, relationships and more. It is typically employed when two parties hold opposing views and are at an impasse. And if compromise does not sacrifice truth or principle, then it can be a worthwhile strategy to advance one’s goals. But when compromise involves abandoning one’s principles and truth, then it will certainly lead to failure and ultimate loss. Is well known for his willingness to verbally assault anyone that might pose a threat to him or that he simply desires to ridicule or mock. It matters not whether the person is an invalid, a woman that doesn’t measure up to his perfect 10 scoring, or a hundred other childish, misogynist or bigoted reasons. Routinely encourages violence against those who disagree with him. Uses mean-spirited racial slurs and disparages various ethnic and religious minorities. Values his own personal ambition, fame and wealth above most anything else. Affirms that America is not an exceptional nation, and he actually has never liked such a designation. Has never asked God for forgiveness and does not even see the need for such. Believes Planned Parenthood does good work. Would order the military to kill the wives and children of terrorists. Has sided with the strong-arm tactics of government over the personal property rights of individuals. Is a big government crony capitalist, doling our millions to politicians, in order to buy personal & business favors. Is a serial liar, personally, professionally and politically. Welcomed Bruce “Caitlyn” Jenner to use the women’s restroom in Trump Tower. 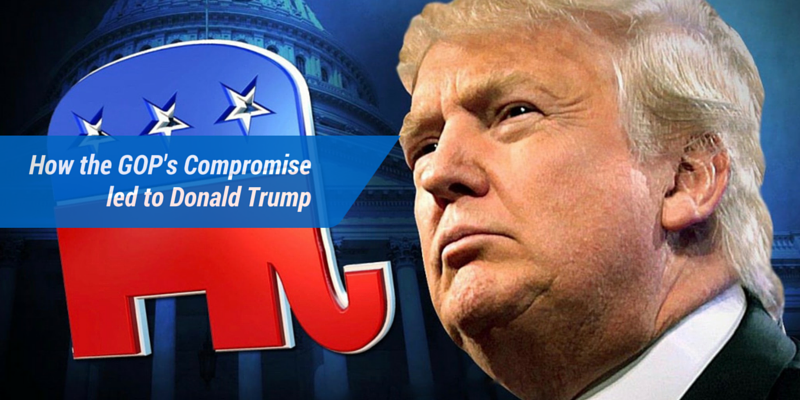 The Republican Platform over the years, including in 2012, has been a manuscript that promoted not only our nation’s founding principles but it affirmed the values that have been synonymous with conservatives. But it’s one thing to enumerate a set of principles via a manuscript and yet another to put those principles into action. Sadly we have witnessed too many Republican leaders willingly compromise our founding principles, to the detriment of the party and the nation. President John F. Kennedy famously once said, “Sometimes party loyalty asks too much.” When such loyalty demands the compromise of truth and principle, that loyalty must not only be abandoned, but it must be exposed for the failure it most certainly will cause. “Always vote for principle, though you may vote alone, and you may cherish the sweetest reflection that your vote is never lost.” John Adams, founding father.